Zachary Bennett-Brook is a surfer and artist, based on the south coast of NSW in Australia. 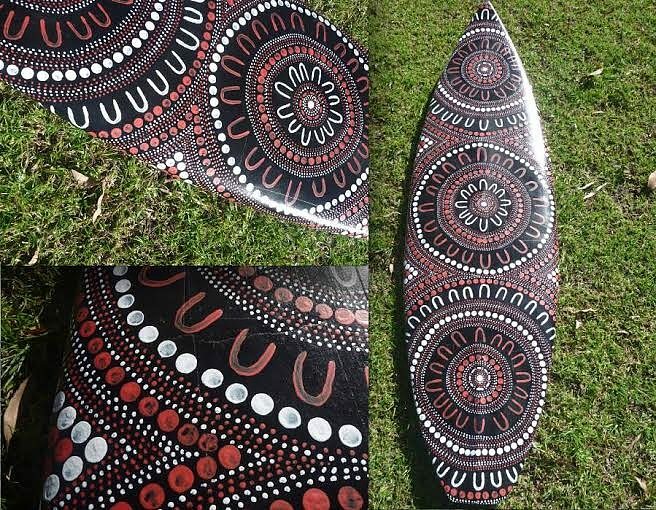 He creates surf art that is unlike anything you’ve probably seen, drawing inspiration from both the ocean and Australian Indigenous culture. We chat to Zac about surfing, art, inspiration and who would accompany him on his dream surf trip (hint: there are a few legends). Hey Zac, how are you doing today? Hey Brad I’m doing great thanks. Its nice and sunny out today which is a great change from the wet weather we have had lately and I had a nice little surf this morning, so I’m feeling fresh and salty. Been getting a few good ones? Yeah I sure have. I scored a few fun waves yesterday out at a little reef at North Wollongong and surfed the same break earlier this morning. It was only 2-3 foot but it’s always great to get out in the ocean and wet. However I have been a bit of a sook lately. I recently spent a few weeks in Hawaii to escape the cold and the water was so nice and warm. It’s hard to pull on the wettie and hop back into the cold winter waters which we have at the moment. Although, with the sun out at the moment it is making the cold water a little more bearable, haha. We’ve been checking out your work and you have some beautiful surfboard art going on! How did you get started and what inspired you to become an artist? Thanks, I guess the whole painting on surfboards thing all started when I was doing a commissioned artwork for a local Primary School. I was getting a little impatient waiting for sections of the paint to dry and thought I would start another painting at the same time. I had this old surfboard laying around and thought it would make a great canvas which would allow me to connect my surfing culture with my Indigenous culture, and the rest is history. I shifted from painting on traditional canvases and focused more on painting surfboards and surf-related objects. I don’t know if I would call myself an artist, I guess I sort of am, haha. I have always been drawing, painting and have been creative for as long as I can remember so I guess it all started from a young age. As I have become older I have refined and changed my art style to what it is now. Your technique is really intricate and rich in detail, how do you conceptualize your paintings? It’s a strange process I go through when I’m in the planning stage and thinking of a design. It will just come to me at weird times, I’ll get a really good idea just as I’m about to fall asleep, when I’m having a shower or in the surf. My head is always filled with new ideas and designs. I should really write them all down, but I never do. I will start painting and it just happens I have this vision in my head of how it will look and I try and replicate it as best as possible. So far this technique has worked pretty well, so I’ll keep doing it while it works for me. Is there a connection between Dreamtime and creative expression? Yeah there sure is and for me I feel it is on a few different levels. Firstly when I’m drifting off to sleep I always get a new idea or design pop into my head. Secondly there is the more obvious connection with Indigenous Dreamtime. Indigenous culture has so many examples of creative expression which are connected to the dreamtime, it can be through dance, song and art. Throughout many of my artworks I use different traditional symbols which are represented in dreaming stories. What are your favourite mediums? What do you use for surfboard art? I really enjoy working with any type of paint, spray paint, oil based or acrylics. For me all my artworks use one of these types of paints which enable me to create my paintings. When I paint on surfboards I will often also use spray paint to get a nice base. The designs I paint on the surfboard are often a combination of acrylic paints and Posca Paint pens, with a clear gloss spray paint to seal it all in once I have finished. It’s a beautiful thing when you can combine your talent with your passion: art and the ocean… How does the ocean inspire your work? I gain so much inspiration from the ocean for me it is a great place to go to and clear my head. I can be sitting out in the surf waiting for a wave and get inspired by the different colours of the water, the way the waves smoothly roll through all the different elements of the ocean inspire my artwork. I have this strong connection to the land and especially the ocean. When I’m at the beach or out in the water I feel connected to my Indigenous culture and this impacts my art,. Are your boards too beautiful to be ridden? I’m sure many would rather treasure them as art…? People always ask if the surfboards I paint on can still be ridden or are they just artworks now. Many of the surfboards I paint have been extremely old and damaged or snapped. So instead of the surfboards going to land fill I recycle them and give the boards a second life. Due to the state of many of the boards they are no longer able to be surfed on and become artworks for many to admire. If you’d grown up far from the ocean and never discovered surfing, what would Zac be painting? I couldn’t image growing up and living anywhere but along the coast hahaha. But if I had I’m not sure what I would be painting on, I think it would be common things like canvases of different size. I have always had a strong connection with my Indigenous heritage so I might have even ended up painting on Didgeridoos. If you could go on a two week surf trip with any three people, including historical figures, who would you choose, where would you go and why? The three people I would take on a two week surfing trip are Duke Kahanamoku, as he is the godfather of surfing and comes from Hawaii an island with strong cultural roots to the land and ocean, similar to Indigenous Australians. Tim Hendricks, I have always admired his art style and what he can do with a tattoo machine is amazing. And the third person I would take is Otis Carey. The way Otis surf’s is insane, he is into his art and is very proud of his Aboriginality and culture. 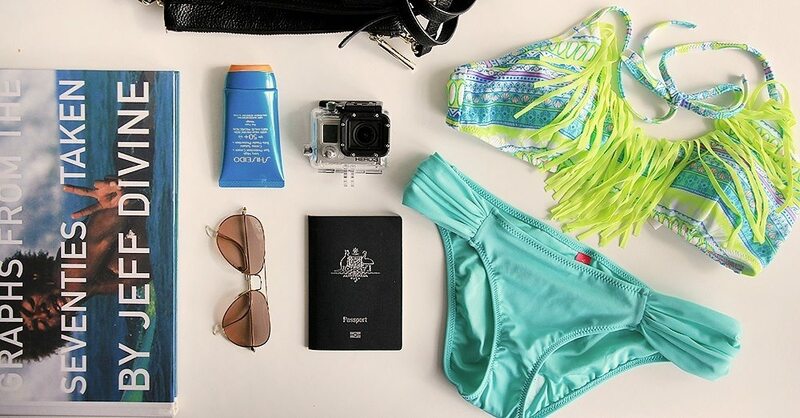 In terms of where we would go I don’t think it would really matter, as long as the days are warm, the sun is out, the water is clear with fun 4 – 5 foot waves. Preferably somewhere with palm tree lined beaches, I have this strange thing for palm trees haha. Thanks Zac, how can people connect with you to find out more? Not a problem, thanks Brad. People can check out more of my work at my online gallery www.saltwaterdreamtime.com and keep up to date with all my projects and adventures by following me on Instagram @saltwaterdreamtime and on Facebook; Saltwater Dreamtime, Cheers.